Are you interested being part of our distribution network? team on Wheels is a company established in Spain in 2008 dedicated to the distribution of the most efficient professional cleaning equipment. We present the latest technologies and innovative cleaning products. We offer professional cleaning services for both shops, offices, restaurants and hotels as individuals. We work under an ecological vision, always concerned about environmental conservation. 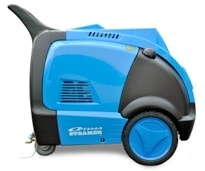 We are changing the commercial cleaning industry with our flagship vapor steam cleaner, the Optima Steamer. We have a wide range of services for your home. We offer a wide range of services for companies. We sell a wide range of machinery for different use. Machinery kit with a special discount! Simply the best industrial grade vapor steam cleaning machine on the market. Steam On Wheels, Professional cleaning services. Official distributor of Optima Steamer in Spain and Portugal. Are you passionate about cars? Would you love to work with them?